Current state of finances, etc. -The size of the domestic art market, based on the price of artwork, decreased by 6.7% from 2011. The size of the domestic art market in 2012 was estimated at a total of 440.5 billion, including 366.8 billion won from sales through the main distribution channels (galleries, auction companies, and art fairs) and 73.7 billion won in purchases of artwork in the public domain (architectural artwork, art banks, and art museums). According to these results, the size of the domestic art market in 2012 showed a 6.7% decrease (of about 31.7 billion) from 472.2 billion in 2011. -Artwork purchases at art museums increased, but public domain activity dropped 20.9% because of a decrease in the installation of architectural artwork. When we examine the actual transactions of artwork by domain without taking into account the overlap between domains, the sum of art sales in the main distribution domain decreased by 4.4% (approximating 18.5 billion won) from 420.9 billion won to 402.4 billion won compared to 2011. The sum of art sales in the public domain decreased by 20.9% (approximating 20.5 billion won) from 98.3 billion won to 77.7 billion won compared to 2011. When we examine the main distribution category, gallery sales decreased 7.1% from 296.3 billion won to 275.1 billion won, and art fair sales fell 9.5% from 46.4 billion won to 42 billion won. On the other hand, sales for auction companies have been on the upswing and have offset the decline in the market with sales increasing by 9.0% from 78.2 billion won in 2011 to 85.2 billion won. The installation of architectural art, which comprises about 80% of art transactions in the public domain, was shown to have decreased by 25.7% to 62 billion won compared to the previous year. Therefore, despite an increase in the purchase of artwork by art museums (a 7.5% increase to 14.2 billion won year on year), it was seen to have contributed to an overall decline in the market. On the other hand, art purchases via the art bank only decreased slightly compared to the previous year, to 1.58 billion won. Besides the overall decline in the sale of art, the number of galleries without any sales in 2012 came out to 124 (31.2% of the total) compared to 66 (17.8%) the year before, roughly twice as many. And in 2012 there were 70 new galleries among the survey targets, but there were also about 50 galleries that had gone out of business or were on their way, indicating that conditions had worsened for small and medium-sized galleries. Despite these conditions, the sales of artwork increased marginally by 3.5% from 2011, although the survey results showed that this increase could be attributed to an improved performance on the part of larger galleries with yearly sales of more than 50 million won. Smaller galleries with yearly sales of less than 50 million won showed a decline in their performance. Furthermore, results showed a polarized market, with the 16 largest galleries with yearly sales of more than one billion making approximately 249.7 billion in sales and taking up 90.8% of the total. The auction market, which has been consistently on the rise, also showed a similar phenomenon. Two large auction companies with yearly sales over 5 billion hit 63.6 billion in sales (74.6% of the total), marking a 44.5% increase from 2011. But nine smaller auction companies with less than one billion won in yearly sales recorded a drop from 28 billion won in sales in 2011 to 11.8 billion. The average also plunged from 3.1 billion won to 1.3 billion won. Moreover, while the sales of artwork rose 9.0% in value from 2011, the number of pieces sold decreased by 27.7%. As with 2011, the survey results showed that most of the transactions concerned high-priced pieces traded through auction companies. The art fair market showed a 9.5% decrease in the total value of art sales compared to 2011, but the number of items sold increased by 51.0%, emphasizing the art fair market’s role as a market for lower and mid-range pieces. The success of art fairs featuring artists with relatively lower-priced pieces was especially noticeable. 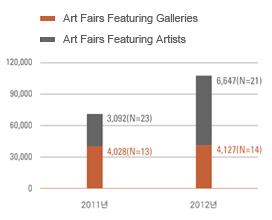 While art fairs featuring galleries suffered a decrease in sales from 36.6 billion won in 2011 to 31.2 billion won (the number of pieces sold increased slightly from 4,028 in 2011 to 4,127), art fairs featuring artists recorded a 9.4% increase in sales compared to the previous year, reaching 10.7 billion won. The number of pieces sold also more than doubled, to 6,647 pieces year on year. The domestic art market is finding it difficult to shake off the downward turn that began in 2011. The number of visitors to galleries is increasing yearly, but these visits are not leading to sales, so galleries remain largely dependent on profits from existing consignments. 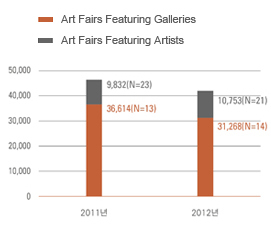 Art fairs are yet another sales channel for galleries. However, examining the current status of sales through gallery participation in fairs shows that, though there is a slight increase in the number of pieces sold through domestic art fairs, the total value of sales shows a decrease. This explains how, despite the emergence of medium-sized and larger art fairs in 2012 (the new gallery-based art fairs in 2012 include Artshow Busan, Busan Alternative Market for Art, Art Asia, and Art Gyeongju), the scope of sales at these fairs actually decreased. The art auction market alone showed growth, but as previously mentioned the largest auction companies led the market, so conditions remain tough for smaller companies. But a variety of online and offline auctions and auction events are making a wider range of prices more easily available. In addition, companies are publishing information about the pieces that feature in auctions and the results of those auctions as part of a tireless attempt to push for price transparency and thus lead to a recovery in the art market. The 2012 Art Market Conditions Survey Report will be distributed in December 2013 to various galleries, auction companies, art fairs, art museums and related institutions as well as subscribers. It will also be available for download from the Korea Arts Management Service Foundation database starting on December 19. End.